Children of divorce or separation live a bifurcated life between their mother and father. They are often at odds with themselves, sometimes standing emotionally in the no-man’s land and mine field between warring adults. Their allegiances’ are torn and their love divided. 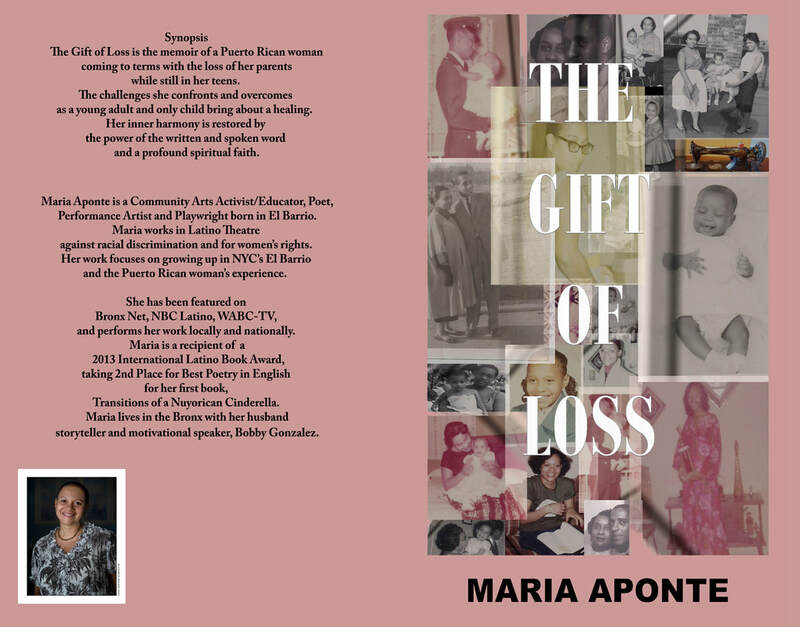 This is the case in Maria Aponte’s memoir “The Gift of Loss,” a combination of prose and poetry explaining how she grew up in and survived those two worlds, not Anglo and Latino, but a life anchored by each parent. Her father is the fun-loving musician who escapes with his daughter to Coney Island and her stern mother hell bent on making sure her daughter graduates school. Told in five chapters, or five orchestral movements, or the five acts of a play, heavy subjects are treated with poise, dignity and a sense of serenity because in the end, Aponte, as a character, chooses both sides. When Aponte writes she captures the depth and nuisance of Puerto Rican life in all of its messy humanity. Her story is uniquely hers and at the same time transcends, gingerly and specifically, lives and iconography common to many Boricuas. It is through two serious traumatic losses, having to become independent, loss of control then finding salvation through poetry and art where “The Gift of Loss” takes off. This is a wonderful albeit short memoir of someone, very Puerto Rican and very universal, finding her place in the world. Aponte’s writing hand gently touches on Boricua life without hyperbole, diatribe or polemics. She proves that the political is personal and the personal political. Aponte describes the 1970s but she could easily have been showing America in the early part of the 21st Century. Orson Welles gets credit for saying that all humans are “born alone, live alone and die alone. We have people around us to give us the illusion that we’re not alone.” Aponte’s work evokes the filmmaker’s sentiments. Aponte also bring to mind the sentiments of author Carson McCullers who ushered in, through her Gothic Southern fiction, a sense of pain, estrangement and loss. Life has a way of offering so much when young then begins taking things away as if one were a naughty child punished for having too much fun, a daisy plucked bald of its petals. Aponte’s work is so very compact, short, and fresh while conjuring El Barrio and the Bronx of the 1970s and 1980s. This is a story of a young lady becoming a woman. Though the title may seem like an oxymoron, “The Gift of Loss” cleverly reveals the circular trajectory of achieving power from pain. Aponte brilliantly demonstrates that while loss may debilitate, it can also liberate. Aponte reveals how the body and soul can grow through struggle, and that one need not hold onto the pains of the past. “The Gift of Loss” is a short read, with a lasting message. A story filled with so much history, culture, and sadness that also manages to provide hope and inspiration for the future.